Principal Kim Jackson, the person responsible for bringing those great days to the 320 students in the pre-K-5 school, moves throughout the commotion, zipping backpacks and giving pats on the back and chatting with a pair of boys about the relative difficulty of solving the four-colors-per-side Rubik’s cube vs. the nine-color. Throughout it all, Jackson carries a Post-It note and marker so she can write down all the questions and concerns the school’s parents and students raise as they head out the door. On this day, it includes helping a father get a replacement for his child’s city transit card and investigating whether there’s room in the afterschool program for a student who recently returned to Seaton. 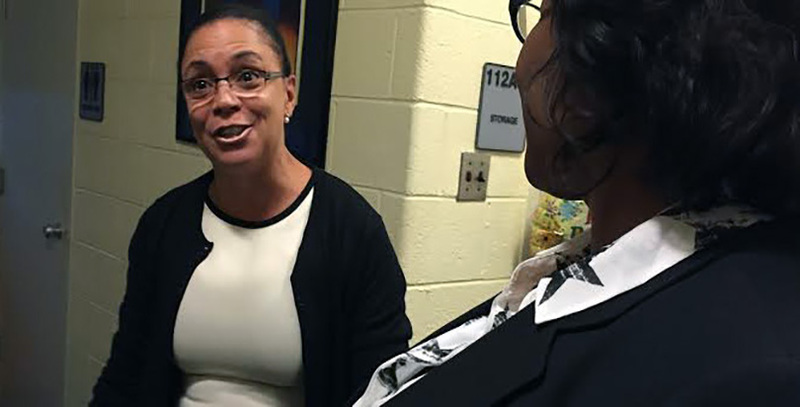 Jackson, beloved by parents, teachers, students and her superiors, was surprised this fall when Chancellor Kaya Henderson showed up at her building to present her with the district’s principal of the year award — and made Jackson call her mother so Henderson could share the good news. 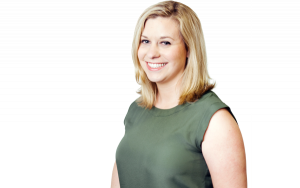 She and the other honorees — the teacher and staff member of the year, plus the winners of nine other awards — will be honored with a gala at the Kennedy Center on Monday hosted by “Project Runway’s” Tim Gunn. 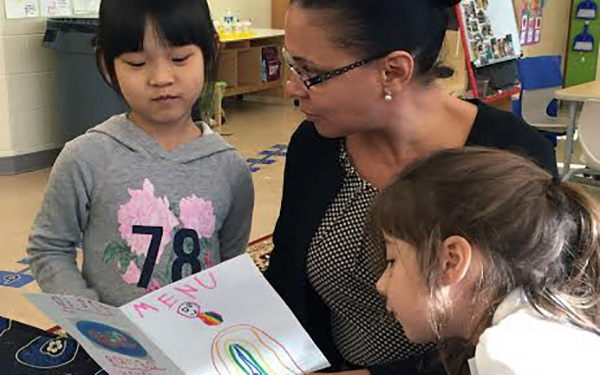 “She really stands in a league of her own,” said Althea Smith, a reading intervention teacher who has taught under five different principals during her 30 years at Seaton. Aileen Murphy, a superintendent in the D.C. Public Schools and Jackson’s supervisor, said Jackson is “the consummate professional and principal.” Jackson often shares credit for the school’s success with her staff, Murphy said, but she is the school leader driving that success. Jackson came to Seaton in 2012. The Washington-area native, who holds degrees from Morgan State University and Coppin State College, worked as a special education teacher and school administrator in Baltimore and Illinois. She took the top job at Seaton having been principal at Moorestown Upper Elementary, a school that served about 900 fourth- through sixth-graders in New Jersey. Jackson has a diverse group of students now under her. The Seaton student body is about 41 percent Hispanic, 35 percent African American, 17 percent Asian and 5 percent white. All papers are sent home in English, Spanish and Mandarin, and the students and staff represent 43 countries. More than 90 percent of students are eligible for free or reduced-priced lunch, a measure of poverty. Jackson’s day starts early. She usually arrives at the school from her home in Maryland between 6:45 and 7:15. She’ll check in with the school’s custodians or hold meetings with staff, but makes it a point to greet students — she calls them friends — either when they arrive at 8:15 for breakfast or at 8:45 when they head off to their classrooms to begin the school day. It’s that focus on students above all else that has resonated with parents. 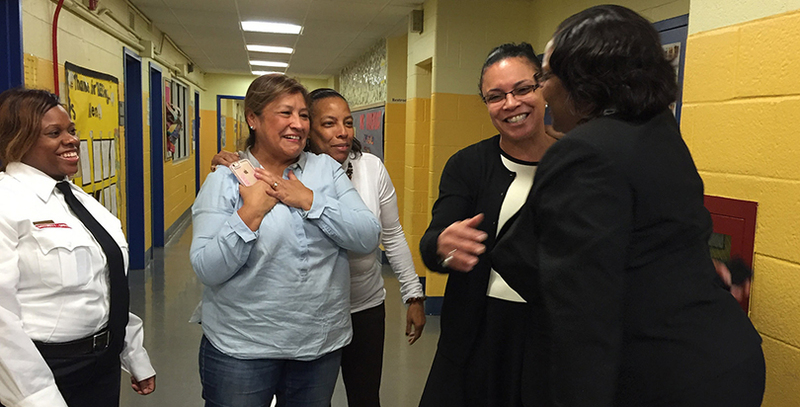 Seaton Elementary School Principal Kim Jackson hugs DCPS Chancellor Kaya Henderson as she's surprised with the D.C. Principal of the Year award in December 2015. Dakiya Boone, school safety officer; Gloria Daisy Torrento-Del Cid, administrative aide; and Lisa Kirkpatrick, after school coordinator, watched the presentation. Washington offers every student a choice of automatic enrollment in their in-boundary school, or entering a lottery system for the rest of the city’s schools: more than 111 traditional schools, including six selective high schools, and 114 charters. About 45 percent of Seaton’s students live within the school’s boundaries, which encompass parts of the Shaw, Truxton Circle and Logan Circle neighborhoods in a rapidly gentrifying part of the Northwest quadrant. The rest come from elsewhere in the city and often continue attending even as their families move farther away. Enrollment is growing, too. There were about 260 students when Jackson started in 2012, about 50 fewer than this year. With a school this bustling and diverse, there are only a few constants in Jackson’s day after she greets students in the morning. They all revolve around spending time with the students. The first part of the routine is her daily lap around the school with Assistant Principal Suzie Jacobs. They try to check in on every teacher at least once a week and offer feedback so their comments don’t come as a surprise during formal evaluations, Jackson said. This day, they start in a pre-K art class, where one student shouts Jackson’s name and holds up a koala bear made from paper plates for her approval. She smiles and exits the room without fanfare to continue her rounds. After art, Jackson and Jacobs are off to a fifth-grade math class. She moves quickly but quietly through the school’s bright yellow hallways, scaling the stairs between the building’s three floors with a practiced ease despite her heels. Here students are learning to multiply fractions. Jackson watches for a few minutes as the teacher wraps his lesson and students split into groups, some working on computers, some gathering with the teacher for more assistance and the final group starting on work sheets. She jumps in with the last group, asking them about the blue cards with yellow transparent overlays showing how a whole is split into parts. Next up is a third-grade class, where students are reading fiction and working on using examples to prove a point. At the sound of kids playing outside, Jackson peeks her head out the window to check on the commotion. On their way to their next destination, a kindergarten class where students listen to a story about the rainforest, a little boy stops on the way back from the restroom and says hello. Jackson and Jacobs greet him by name, and don’t mention the sticker of a ghost on his forehead — upside down. The last stop of the morning is a fourth-grade health class, where students are making anti-smoking posters. Throughout it all, Jackson exudes positivity, the key characteristic of her leadership style at Seaton. For some students, especially really young ones, the principal can be a foreboding figure. Not Jackson, though. The adults in the building respond to it, too. “It’s like a magnet. When someone has that much positive energy, you have no option but to be a positive person and just do as they do,” said Terrence Chavis, the health and gym teacher at Seaton for the last 11 years. Seaton, in pursuit of a healthy schools award, gives every student 30 minutes of phys ed a day. That means Chavis has 10, half-hour gym classes every day. “It is absolutely exhausting, but she walks by and you just look at her face and she’s smiling, and you just push on and you know that the kids are benefitting 100 percent from it. It just makes my job that much more meaningful,” he said. After the daily morning walk-through, Jackson’s next constant is a turn at either lunch or recess duty, a job some educators dread. Jackson does it every day. “When she first got here three years ago, she did recess duty and I could not believe it. As long as I’ve been here, I’ve never seen a principal ever do recess duty. I’m talking about every day,” said Smith, the 30-year Seaton veteran. The other totally non-negotiable part of her day is her 1 p.m. reading interventions class with a handful of fourth-graders. She’ll also do another lap of the school at some point during the afternoon. Then she stops in to help a second-grade teacher talk out some issues with supplies and how she’ll organize her bulletin boards before sticking her head in the teacher’s lounge to check on the new staff member who’s in charge of the school’s garden. Faculty said they appreciate that Jackson doesn’t give them unnecessary assignments or intervene when it isn’t helpful. When she’s not doing one of her few daily constants, she handles paperwork and meetings for the school’s special education students (she’s the special education coordinator, too), troubleshoots problems or visits with parents and teachers. On the day of The Seventy Four’s visit, she files some special education paperwork, then consults with the teacher of one of the classes for autistic children (the school added a third this year) about a student who got a bloody lip after some dental surgery. She’s just sitting down to write her thank yous for the principal of the year award when a student runs into her office and breathlessly tells her that one student has hit another in a class being minded by a substitute. Jackson springs into action — the incident is a “really big deal” at the school, which usually doesn’t have discipline problems, she says. She takes each child separately into a conference room to talk about the event, and she’ll call the parents of both later. The unpleasantness handled, she checks in on the fourth-graders, who have just returned from a field trip to one of the city’s art museums. At 3:10 sharp, the close of “another great day” at Seaton school and time for the end-of-day announcements. Jackson commends the five classes that had perfect attendance that day and reminds the children that it’s her expectation that they attend school on time, every day, in uniform — navy skirts or pants and a white collared shirt or T-shirt with the school’s logo, a bee reading a book. She’ll have more meetings in the afternoon before she leaves, usually sometime between 5 and 6 in the evening. Jackson has three daughters — Morgan, who graduated from Howard University, whose campus is not far from Seaton; Taylor, a senior at Villanova University; and Macie, a middle schooler in Maryland. Jackson knows she could be using some of her time during the day dealing with paperwork, evaluations and other more traditional-type principal duties, instead of spending so much time with the kids. She doesn’t think that time is wasted, though.